Isn’t it wonderful how we can make online friends – and call them dear friends – even though we’ve never met them face to face? That is the case for my guest blogger today. I met Kerin Mesanko through SparkPeople and we hit it off right away. 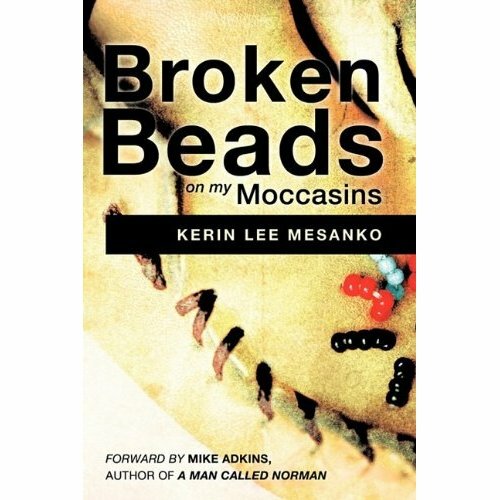 Both of us were aspiring writers at the time and since we met, Kerin has published a devotional book “Broken Beads on My Moccasins” based on major events in her own life. She shares what the Lord taught her through these events and she is honest, transparent, sometimes funny, always gentle and loving. For more information on her book, and to place an order, click on the book cover above! A “must” devotional book for every woman! Looking out the kitchen window, Mom could see my clothes heaped in the yard. My brothers were still present, having busied themselves with cars, trucks, and sand piles. So after returning the phone to its clutch and picking my shorts up off the ground, Mom set off, with two other little ones in tow, to retrieve me for the third time that week. The gate around the property had always remained locked. At age three, I had managed to ascend over it leaving my clothes behind when they hindered my climbing ability. From where I stood within the boundaries of that little green haven, the outside world looked much more inviting. But to a greater degree, it was the excitement of breaking away that held me tenaciously to that act. I did it because I discovered I could. As we grow older, we tend to draw safe little edges around our lives, forgetting the thrill of escape learned earlier in childhood. Once we determine that coloring within the lines generates a noteworthy picture, we can’t imagine doing it any other way. And although God wants us to be disciplined in how we venture through life, sometimes He creates opportunities for us to climb over the gate and color outside the lines so that a ministerial masterpiece can be produced. The world is a banquet full of wonderful surprises, and our creative choices are not limited. As God’s people we have more freedom than we realize. Christ has supplied us with an extensive arrangement of tools that can be used to frame our existence. It’s often okay to climb over the fence and beyond existing comfort zones to step vulnerable into the field to expose His grace, love, and truth. Knowing that, if you go too far, He’ll just come and get you. Lord, assist us in leaving our comfort zones to expand upon Your glory. Amen.